Best Hostel! You feel welcome right away, lots of activities and the breakfast is delicious. Can only recommend staying there. Super Staff, super hostel en general even if we have been told it isn’t the safest area in Quito, but nothing never happened to us so... go for it! Lugar para gente joven. La estancia muy bien cumplió todas las expectativas. Probably the most well equipped and most comfortable hostel I have been to! Awesome clean showers and toilets, delicious breakfast, free tee and coffee throughout the day, chill area with a TV, Netflix and blankets, nice atmosphere and very friendly + helpful stuff. I can highly recommend it! Unfortunately, not in the best location. There is not much to see or to do in the area around. Great place to meet people with many activities offered by the hostel and a nice chill out area. A power socket is included in every locker which makes life easy. Good breakfast and dinner, though a bit pricey. 10 bed dorm I stayed in actually is linked with a 6 bed dorm, but not a big deal. Community always provides a good atmosphere, nice food, helpful staff and reliable internet. Unfortunately this one is not as well maintained or clean as some of the others, but still a great place to stay for a couple of nights especially as a solo traveller. El peor hostal de todo mi viaje por Latinoamerica de 4 meses. 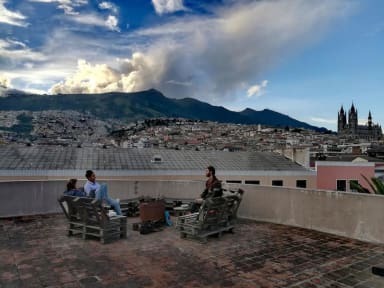 Ruido toda la noche, la zona más fea y peligrosa de Quito, esperar para poder utilizar el baño sucio y el colmo compartir la habitación con 1 tomado que orino a las 2:30 en medio de la habitación y provocó un pleito.